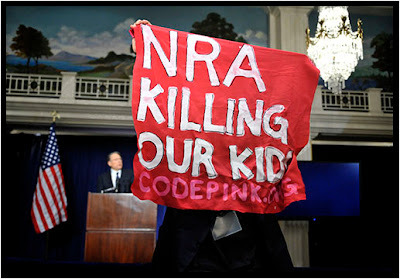 This was part of the scene yesterday as the NRA and its executive vice president, Wayne LaPierre, held a press conference one week after the mass slayings at Sandy Hook Elementary School in Newtown, Connecticut. Mr. LaPierre's recommendations - more armed people at schools. "The only thing that stops a bad guy with a gun is a good guy with a gun."